CROSBY– Members of the Economic Development committee of the Crosby/Huffman Chamber met with Commissioner Jerry Eversole last week, to review progress and design details on the proposed overpass to be built by the Texas Department of Transportation on FM2100, over the main Union Pacific railroad tracks near Kernohan. Chairman Larry Koslovsky and other committee members heard Eversole discuss schedule, progress to date, and what the County can pay for, and not. The committee also reviewed some design sketches, prepared by architect Gilbert Hoffman after meetings with TxDOT engineers. They seek to portray the communitys desire to blend the new structure in to the existing older city fabric. The sketches show antique style lighting, concrete railings and support structures reminiscent of older county roads and bridges. The overpass is being built in an area of Crosby that is historically the earliest business center. The overpass is planned to be four lanes, with frontage roads at grade. Eversole said that surveying is now underway, bids would be let in the 4th quarter of 2004, with construction beginning by July 2005. Completion could follow in 16 to 24 months after that. DAYTON Last year, when Crosby ISD decided to hold classes on Memorial Day local veteran Joe Anselmo helped organize a protest in front of the high school which he says drew national attention. This year, perceiving a similar injustice in Dayton, Anselmo aided members of the Liberty Veterans of Foreign Wars Post #562 and the local American Legion Post in forming their own protest in front of the Dayton ISD Administration Building. 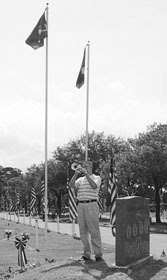 According to the DISD school calendar, which was approved by the board of trustees in January 2002, Memorial Day was set aside as a bad weather day. Greg Hayman, assistant superintendent of the district, said that in the fall, the school district was forced to close its campuses under threat of a hurricane, which eventually turned away from the area. In order to get the 180 days of instruction mandated by the state, he said, the district had to use May 26 as an instruction day. Anselmo said that when he heard that Dayton would be holding classes, he attempted to contact the superintendent, Nancy Fuller, twice. Eventually, he said, he heard back from her and she told him that while students would be in class they will be and have been taught the meaning behind Memorial Day. Despite the efforts by the school district to offer an educational alternative to releasing students, Anselmo said that it wasnt good enough and that students should not have to attend class on Memorial Day. Anselmo said that a successful protest in Crosby last year inspired State Senator John Whitmire of Houston to file legislation that would prohibit schools from holding class on Memorial Day. This legislation, Anselmo said, has passed both houses and is awaiting the governors signature to make it law. Hayman said that it is ironic that there were two school districts within Whitmires 15th Senatorial District who chose to classify Memorial Day as a bad weather day and could have been forced to hold classes. Dayton was not the only local school district to hold classes on Memorial Day this year. Liberty ISD also held classes. Les Wylie, commander of the Liberty VFW, said that they did not plan to protest in Liberty because they did not have enough people available. While classes were held in Dayton Monday, it was not business as usual. At 9:30 a.m. students from every campus, along with parents and community members gathered at Bronco Stadium for a Memorial Day Celebration. This celebration included a performance by the Wilson Junior High Band, a recognition of Dayton veterans and reading of student essays dealing with patriotism. Highlands Rotary Club presented their Scholarships last week to college-bound students. 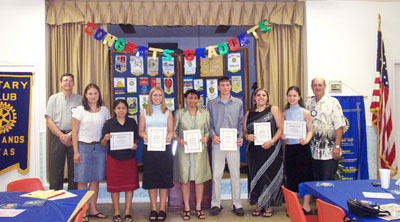 Each year the local club presents 8 scholarships, worth $1000 each per school year, to outstnding local students who have presented applications and grade transcripts for consideration by a committee of the club. Recipients this year, their school, college choice and major are as follows: HOLLI SWICK, Texas A&M, wildlife & fisheries; MAYRA GARCIA, Chinquapin, Trinity Univ., environmental studies; HILLARY CREEL, Sterling, Lee College, education; TARRELL THIBODEAUX, Sterling, UT Austin, pre-med; DUSTIN JONES, Sterling, Lee College, business; KRISTINA WESELKA, Sterling, UT Richardson, cosmetology/psychology; KRISTAN HOFFMAN, Bellaire, Carnegie Mellon, english. Inset photo, REBECCA NIBBE, Sterling, Univ. of Mary Hardin/Baylor, business. Also seen in the photo above are Larry White, club scholarship chairman, and Joe Hausberger, club president. Funds for the scholarships come from the Chili Feast held each February by the Rotary Club of Highlands. Mayra Garcia received the Jay E. Bird Honorary Scholarship, and Kristan Hoffman received the Beverly Culbreath Honorary Scholarship. CROSBY  Beginning Tuesday, May 20, residents inside Crosby Municipal Utility District had begun to complain of foul taste and odor from their drinking water. The water smelled and looked dirty. My neighbor said it made her sick. expressed a pretty lady at a weekend gathering. Crosby M.U.D. board member Raymond Johnson explained that the taste and odor in the local water had come from an algae bloom. Scientists describe an algae bloom as a formation of microscopic aquatic plants in freshwater. This eutrophication process is an excessive growth of algae or other water plants which depletes oxygen levels of deeper water. According to Johnson, the water district has a 4 bay pond in the surface water plant that was overflowed three feet to get rid of the algae infested water. Thereafter, the system was flushed, hydrants were drained to remove algae from the lines. EAST HARRIS COUNTY– The morning hours of May 17 were interrupted with a high-speed chase which began in eastern Chambers county and ended with a suspect reportedly killing himself at a Wal-Mart in East Harris County. According to authorities, at approximately 10:45 a.m. a Department of Public Safety trooper attempted to make what has been described as a “routine traffic stop” of a green Dodge 1500 4×4 pickup with Kentucky license plates traveling westbound on Interstate 10, near mile marker 821. This is approximately 21 miles west of Mont Belvieu. The driver of the vehicle has been identified as David D. Armstrong, 36, of Hardin Co. Ky. Troopers say that when the vehicle failed to pull over they ran a check on the vehicle. A report came back that the registered owner of the vehicle was wanted on federal charges of manufacturing methamphetamines. Troopers pursued the truck along Interstate 10, at times reaching speeds in excess of 100 miles per hour. After passing by Baytown and Highlands, the truck continued toward Houston. Eventually, the driver pulled into a parking lot of a Wal-Mart located at 13750 I-10, near the Freeport exit. The suspect then left the vehicle near the front door of the store. As he did, authorities say that he was carrying a handgun. Despite a trooper firing a shot in his direction, the suspect entered the store. Witnesses say that the man then grabbed a clerk and forced her at gunpoint into a dressing area in the middle of the store. The man is then believed to have shot himself once in the head. Both the suspect and the hostage were taken to Memorial-Hermann Hospital via LifeFlight air ambulance. The man was pronounced dead shortly after arrival at the hospital, while the clerk was treated for minor injuries. The case is under investigation by the Texas Department of Public Safety, the Harris County Sheriff’s Department Homicide Division and the Harris County District Attorney’s Civil Rights Division. LYNCHBURG– Harris County Precinct Two Commissioner Sylvia R. Garcia announced Friday that work will begin before the end of May on $830,000 worth of improvements to the historic Lynchburg Ferry. Signs will be posted Monday, May 12 to inform motorists that ferry operations will be shut down at 9 a.m. May 27 and remain closed until August 25. During that time, Sneed Shipbuilding, Inc. will repaint both ferryboats — the William P. Hobby and Ross S. Sterling — and also make structural repairs. While the ferryboats are being overhauled, NBG Constructors, Inc. will repair both the north and south landings. The work on the boats will cost $269,100 and the repairs to the landings will be $560,900. The work on the landings will consist of replacing broken and worn parts, rusting cables and wooden pilings. Both projects were unanimously approved by Harris County Commissioners Court earlier this year. And, Commissioner Garcia said, both projects are being done at the same time so Precinct Two can cut down on the amount of time that the Lynchburg Ferry — a 24-hour operation — will be out of service. The Lynchburg Ferry has been around since 1822. It has been a Harris County operation since 1888 and, Commissioner Garcia said, it adds a rich layer of history to Precinct Two. After the ferry is operational again, Commissioner Garcia said she will meet with community leaders about the future of mobility in the region and what role the Lynchburg Ferry will play. While the ferry service is shut down, officials are recommending two alternate routes for motorists: the Washburn Tunnel and the Fred Hartman Bridge. This is my favorite time of the year with the wonderful smell of honeysuckle in bloom, gardeners reaping the benefits of their labor, birds gathering straw and bugs for their nest and the many varieties of birds feeding on the two large stumps out back and kitchen window ledge. Wondering what the little sparrow birds are with a red top, red throat and chest? A jar of chowchow for the first one to correctly identify that little bird. Had my first hummingbird of the year yesterday. The Purple Martins are back too; we do enjoy watching them. I had another first Friday; celery with crunchy peanut butter spread on it. Attending the Baytown Chamber of Commerce Expo, the lady at the old folks booth across the aisle was munching on one and I hollered over, Whatcho eating? She told me and offered me one. I moseyed on over and ate it up, good too. I even bought some celery this morning, already had the peanut butter. Had my first fried green tomatoes for the year last night. They were good as always. Ill be making chowchow real soon, wanna help? While on a visit to Vaughans nursery in Channelview last week getting my Cow Horn pepper plants and saw a Georgia Rattlesnake plant. I bought it out of curiosity. I dont normally grow watermelons because they take up so much ground. Besides, the seedless variety has me spoiled rotten. As you probably know, I am from Georgia and proud of it. Can you believe the state of Georgia is on their fourth flag? The state legislature just approved a new one. My my my!!! They change flags more than most banks change names. They are trying to please everybody and offend no one  thats hard to do. I have my old Georgia flag hanging in this room. I need to get a Lone Star flag and be done with it. I did get my Confederate Rose in the ground and it is looking good, its my first one. One of the few things I plant because you caint eat it. My gardening guru from Highlands gave me a Seven Sister Antique Rose and it is yet to be in the ground. That is another one of those things that you caint eat but should compliment the back yard with its pretty looks when in bloom. Do you know what a Confederate Rose or a Seven Sister Rose looks like? They are one of the finer things in life as you grow older and learn to appreciate even if you caint eat them. While Democrats welcomed an opinion from Texas Attorney General Greg Abbott that the Texas Legislature does not have to draw new congressional districts, the Republican majority leader of the U.S. House said it should be done anyway. The Texas delegation in Congress is serving in districts drawn by a three-judge federal court after the Legislature failed to do so in 2001. On cue, House Redistricting Committee Chairman Joe Crabb, R-Kingwood, said hell hold a public hearing next week on the topic. The districts under the court map, which paid attention to incumbents while creating two new Republican districts, elected 17 Democrats and 15 Republicans. DeLay contended because Republicans got more votes for Congress than Democrats, new districts should be drawn to reverse those numbers. But he denied that amounts to a quota system. DeLay, in Austin Thursday for Former Members Day in the Texas House where he served in the early 1980s, admitted that the bill hes been pushing might face tough sledding in the Texas Senate, where a two-thirds vote traditionally is required to bring bills to the floor. But he thinks it should be considered anyway. DeLay said he met with Gov. Rick Perry, Senate presiding officer Lt. Gov. David Dewhurst, and House Speaker Tom Craddick. DeLay said Dewhurst said the Senate will get a redistricting bill to the floor if the House passes it. Dewhurst said later through a spokesman that the Senate will consider the bill only if the House passes it, and then it will go through the normal committee process. Rep. Joe Deshotel, D-Beaumont, who chairs the Black Caucus, was asked why DeLay should care what Texas House Democrats think when he runs roughshod over Democrats in Washington. McNeely can be contacted at 512/445-3644 or dmcneely@ statesman.com.